The selection of the Main Tree was a long process carried out by the special commitee, wich included the specialists from the Forestry and Transportation department, as well as people of art and culture. For the occasion the 100 year old representative of its species was selected. The tree of this year is 30 meters high, the trunk is 0.7 meters wide and the spread of lower branches is 15 meters. 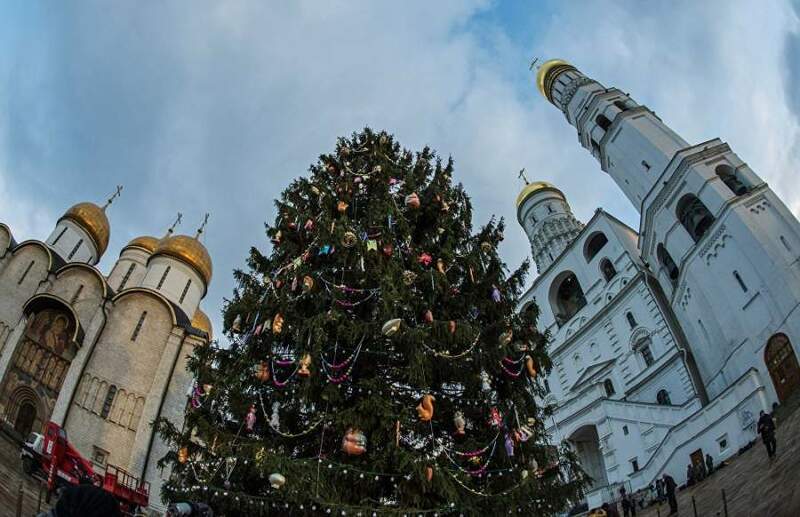 The tree will stand tall for all three weeks of the Winter Holidays decorating the main square of Kremlin - the Cathedral Square. Further, it will be used for creating souvenirs - the hockey sticks and nesting boxes. The pre-revolutionary tradition of decorating the square with the Christmas Tree, was re-established in 1996th by the first president of Russia, Boris Yeltsin. In the Imperial Russia, the tree was set on the square each time the tsar's family was spending the New Year time in Moscow. Following the tradition, the natural tree was used for decoration, and only for a while it was interrupted due to the strong frosts and heavy snowfalls, which have prevented the delivery of the tree to the city center. During those years the artificial tree was used, which now decorates the Red Square.